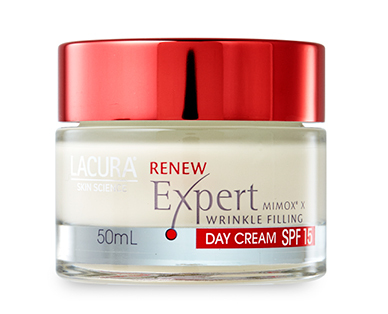 LACURA® Skin Science Renew Expert Day Cream SPF 15 50ml, contains a special UVA/UVB filter system with SPF 15, in combination with an antioxidative protective complex, which protects the skin from aging caused by the sun. Contains an impressive trio of active ingredients which effectively counteract the signs of aging. The anti-aging day cream also contains a special UVA/UVB filter system with SPF15, in combination with an antioxidative protective complex, which protects the skin from aging caused by the sun. Contains active ingredients Glycerine Plus, Hyaluronic, Acid and Pro vitamine B5, to provide 24 hours moisture.